Last week Tim joined a team of six from South Africa to make a short visit to YWAM Bulawayo in Zimbabwe. The team was made up of Member Care staff and other leaders and - as well as their expertise - they took with them food supplies and some cash towards the ongoing base renovation costs (the base is a little run down). There was opportunity for one-on-ones with most of the 8 Zimbabwean staff. The visiting team prayed and then reflected later on this time. Tim says: "We all felt that the morale was good on the base. There was a sense of renewed purpose and fresh vision. The staff had recently begun work repainting and rebuilding – and this physical work seemed to reflect the spiritual state. In prayer we sensed that the base had “moved beyond survival mode” and were in a time of Nehemiah-like vision and rebuilding of broken walls." 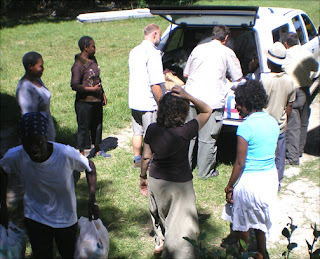 The base contributed gifts from their own finances towards the food, towards the YWAM Africa Field Office, and also towards YWAM’s monthly day of prayer. This reflected their deep desire for connection to the wider YWAM family. The base leader, Patricia Biassi, thanked the team, and Kobus Van Niekerk in particular, for frequent visits and faithful support over the recent years. Without this, Pat said, she would have lost hope. Now she senses God giving fresh vision and she expressed deep gratitude to those outside Zimbabwe who have given and encouraged her team through the hard times. Zimbabwe continues to be in a critical and unstable state. Mega-inflation of 18,000% means the few goods in the shops are very expensive. Presidential elections are scheduled for 29th March 2008. Pray for the country during the time of campaigning, as this is a potentially explosive season. Another trip is planned for April, after the elections, to take in more food, building supplies and money.